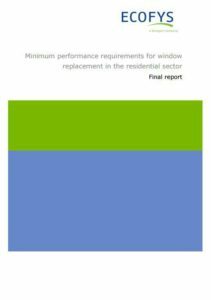 The study developed a comprehensive list of minimum performance requirements for windows (U-values and when appropriate g-values) for windows replacement in the residential sector in the 28 EU Member States. The main result is a table showing an overview about legal requirements for replacement of windows in residential buildings by Member State. This table is followed by brief explanations allowing an unambiguous interpretation of the numbers in the table. A table informing about the interviewed person and the national regulation follows these explanations.